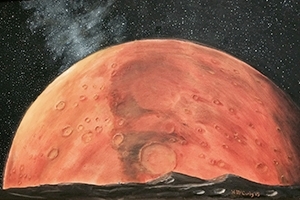 The Red Planet | American University Washington D.C.
Howard McCurdy painted this image of Mars, and it hangs in his office in Ward Circle Building. Few events captured the American imagination like the moon landing on July 20, 1969. It was undoubtedly one of the great moments of the 20th century, a testament to national will and human progress. As we approach the 46th anniversary of the first walk on the moon, another adventure looms on the horizon: a mission to send people to Mars. Could this be NASA's—and humanity's—signature achievement of the 21st century? Howard McCurdy, a professor at American University's School of Public Affairs, is a space policy expert familiar with NASA's thinking on this issue. In a recent interview, he discussed the prospect of a human spaceflight to the Red Planet. McCurdy says NASA's plan is travel to Mars in the next 20 years or so. "There's no Mars landing program underway right now. But what is underway is the development of capabilities, with the funds that they have," he says. "When we get to the end of the capability development phase, we'll look at how much it costs to actually send cargo and crews to Mars. And somebody will have to make that decision at that point." One substantial challenge for any mission would be how to land on Mars. A large spacecraft (about as big as the International Space Station) might go into Mars' orbit and release a smaller lander, with a crew of about five or six people. That lander, possibly bus-sized, would descend at about 12,000 MPH onto a planet with an extremely thin atmosphere. "The science of flight is really the science of atmospheric dynamics," he says. Even that 12,000 MPH figure might be understating the speed, if an alternative method of propulsion is used. The time it takes to get to Mars is another concern, McCurdy says. Utilizing similar technology to a moon trip—massive tanks of hydrogen and oxygen and burning those fuels—you'd need to go about 25,000 MPH to push out of the gravitational well of the Earth. Allowing for varying speeds, this trip could take about 9 months, he explains. "By the time you get to Mars, the Earth has gone around the Sun, relative to Mars. And you can't come back," he says. "You've got to wait 26 months or so before the two planets get close enough to each other for a return voyage of 8 or 9 months." Ideally, he says, you'd like to make this a less time-consuming trip. Traveling to the moon first could be advantageous, serving as a fuel depot to propel the spacecraft to Mars. Yet McCurdy says that a moon fuel depot would probably eat up too much of NASA's budget, and a direct flight to Mars may be more cost-efficient. Some observers think SpaceX or another private company could make it to Mars before NASA. McCurdy says that commercial enterprises might be able to pull off a Mars mission because, unlike the U.S. government, they'd have less impetus to return to Earth. And as crazy as this might sound, McCurdy notes that it's part of an exploratory tradition. "The Irish who migrated during the Potato Famine knew when they hugged each other in Limerick, that was the last time they were ever going to see each other," he says. This entrepreneurial spirit may be laudable, but it could result in more controversial ventures like Mars One, a Netherlands-based organization hoping to set up a human colony on the Red Planet. NASA, conversely, bears a responsibility to bring astronauts home safely. McCurdy, who leads the new Public Policy for Innovation Initiative, argues that the financial costs of the Apollo missions have been wildly exaggerated. The most expensive Apollo mission was about $450 million, he says. And with production lines in place, the costs came down with subsequent trips. "People misread what Apollo cost. And it scares off a lot of people who say, 'Oh my god, if Apollo cost $25 billion, which is $250 billion today, how can we afford to go to Mars?'" McCurdy explains. He believes that if the Apollo program was economically feasible, the U.S. can also complete a mission to Mars at an affordable price. Though some people are skeptical of a Mars mission, McCurdy succinctly explains why it's a worthwhile endeavor: "You would like to know as much about another planet as you know about the Earth. Just studying the Earth is like trying to take a statistical sample that predicts the outcome of a presidential election by asking one person." NASA is currently planning a robotic mission to Europa, an icy moon of Jupiter that could show evidence of extraterrestrial life. That's also a reason to explore Mars. Yet given the apparent similarities between Earth and Mars, there is even more to learn. "We would like to know why Mars lost most of its atmosphere. We would like to know where the water went. We would like to know, 'Were there just puddles of water, or were there oceans of water?'" he says. "What happened to that planet that made it turn out the way it turned out, while ours turned out the way ours turned out? And are those dynamics still present on the Earth?"